Whether you’re adding a new garage to your home, or your existing doors need refreshing or replacing, you can rely on us to provide you with the service that’s perfect for your requirements. Our broad selection of garage door types, only supplied by the most reliable, best-known brands in the industry, ensure that we’re able to supply your home with the perfect door. Our range of garage doors includes everything from sectional and retractable styles to roller and overhead canopy variants. Our links to quality manufacturers, including Hormann, Garador, and Novoferm, give our customers the peace of mind that our reputation is warranted. We both supply and install garage doors, giving our customers in the St Albans area a complete and comprehensive solution. We’re able to provide an exemplary service throughout St Albans and the surrounding areas, partly because of our location. We’re a local company, based in Dunstable, under a half-hour drive away along the M1. That means we’re never too far away should you need to call us back out, or drop by for an enquiry of any kind. It definitely helps to know an area you’re working in, and our experience in St Albans gives us that boost. The condition and working order of your garage door is absolutely essential when it comes to ensuring the security and integrity of your home. Entering your property through the garage is one of the most common methods of entry for criminals; all it takes is a weak hinge or a compromised locking system and it becomes an easy target. At the very least, poorly working garage doors cause enormous inconvenience and, if left over time, issues can develop into far more expensive repairs or even replacements. That’s why we offer a comprehensive garage door repairs service for all of our customers acros St Albans, allowing us to carry out any necessary remedial work on your doors, from lock replacements to mechanical repairs. All of our work is backed by a 12 month guarantee, too. Our reputation is superb. 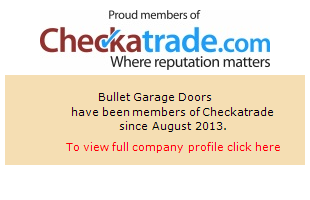 You can view a number of testimonials here, on our website, and have a look at our Checkatrade profile. In both places, you’ll find a host of customers who were (and still are!) extremely happy with the work we’ve done for them. For further details about our products and services, get in touch with the team today. You can give us a call on 01582 932 025, or fill out one of our online contact forms. We look forward to working with you. Removed old door frame, with garden gate and frame and fitted new group door in walnut. This had a new timber frame complete with new gate with new timber posts.